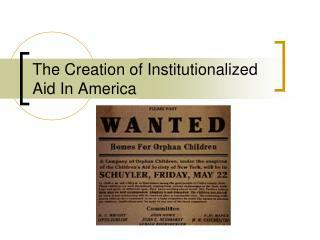 After 1783, the year of American independence, a movement for “modernizing” welfare slowly developed. 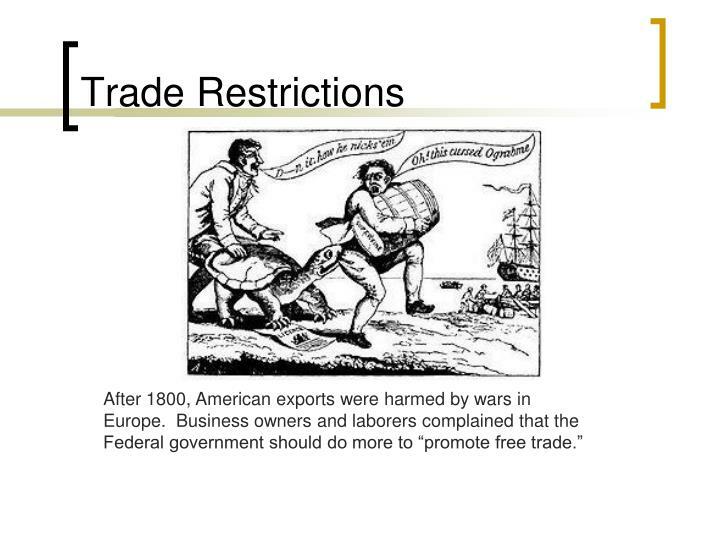 Partly this was the result of an urge to discard some of the British customs in favor of “American” solutions. 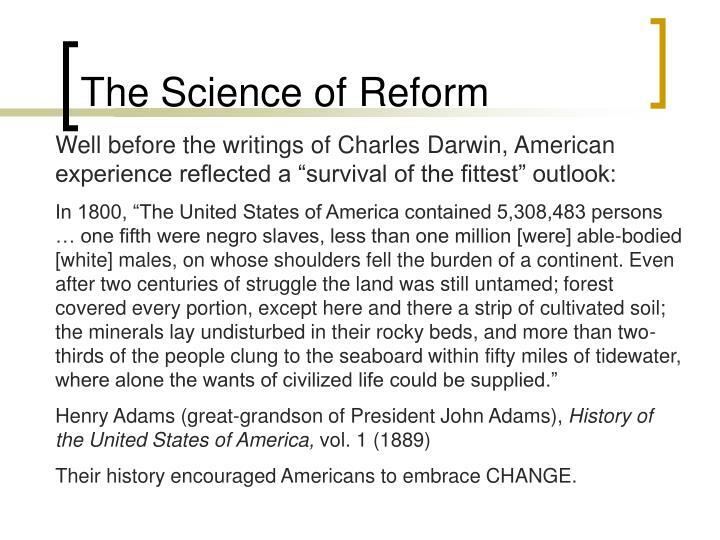 Other factors for change included the rise of a belief in “environmental” change – 200 years of altering the landscape of a continent made Americans confident that behavior could be changed by changing the setting in which one lived. A final factor was social control – American ideals centered on freedom, which meant less respect for (and deference toward) ruling elites. 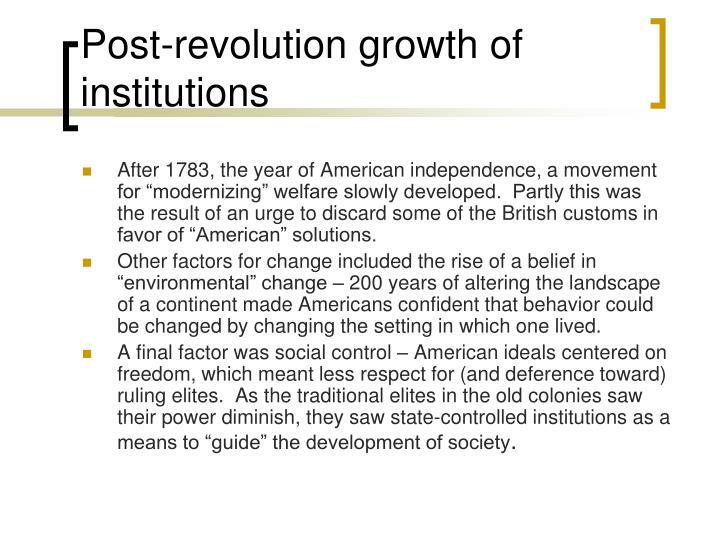 As the traditional elites in the old colonies saw their power diminish, they saw state-controlled institutions as a means to “guide” the development of society. 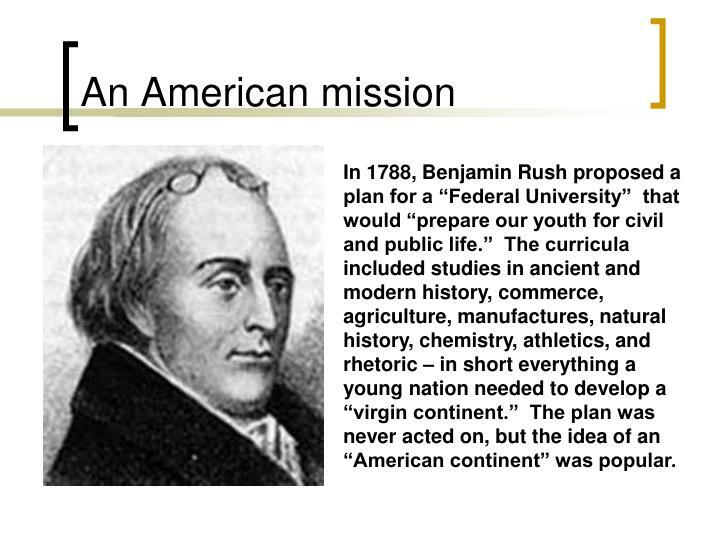 In 1788, Benjamin Rush proposed a plan for a “Federal University” that would “prepare our youth for civil and public life.” The curricula included studies in ancient and modern history, commerce, agriculture, manufactures, natural history, chemistry, athletics, and rhetoric – in short everything a young nation needed to develop a “virgin continent.” The plan was never acted on, but the idea of an “American continent” was popular. 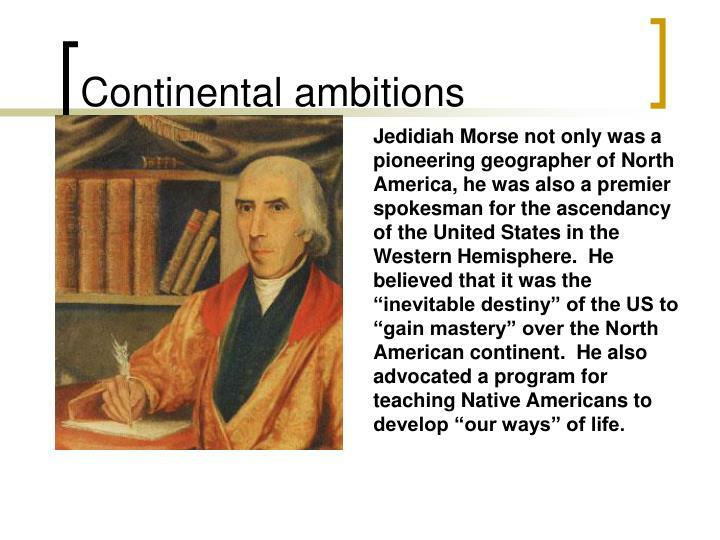 Jedidiah Morse not only was a pioneering geographer of North America, he was also a premier spokesman for the ascendancy of the United States in the Western Hemisphere. 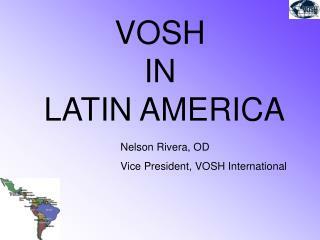 He believed that it was the “inevitable destiny” of the US to “gain mastery” over the North American continent. 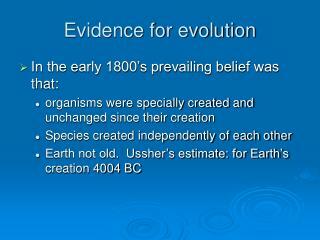 He also advocated a program for teaching Native Americans to develop “our ways” of life. 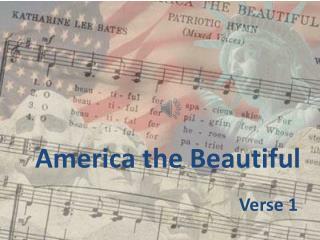 Their history encouraged Americans to embrace CHANGE. 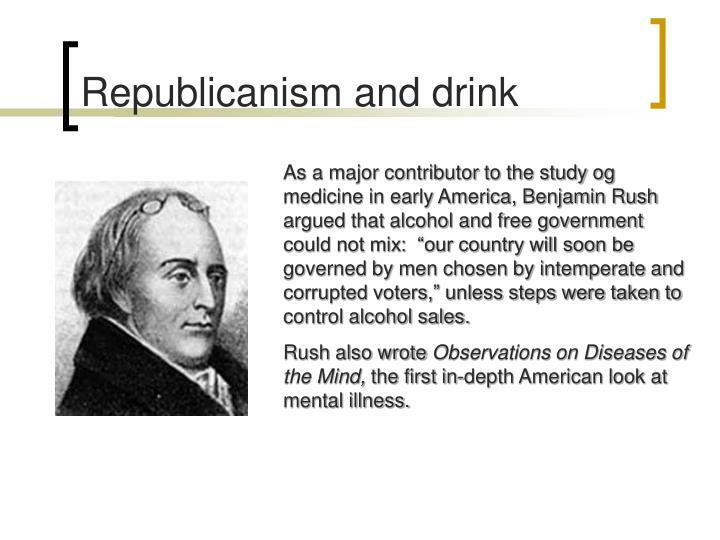 As a major contributor to the study og medicine in early America, Benjamin Rush argued that alcohol and free government could not mix: “our country will soon be governed by men chosen by intemperate and corrupted voters,” unless steps were taken to control alcohol sales. Rush also wrote Observations on Diseases of the Mind, the first in-depth American look at mental illness. 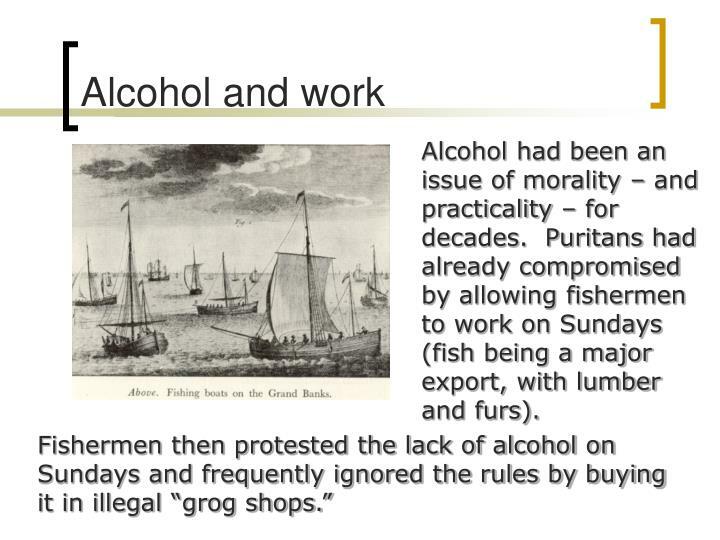 Alcohol had been an issue of morality – and practicality – for decades. 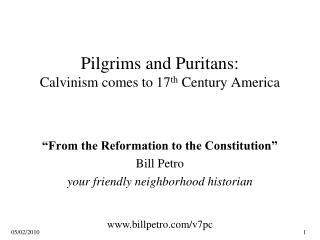 Puritans had already compromised by allowing fishermen to work on Sundays (fish being a major export, with lumber and furs). 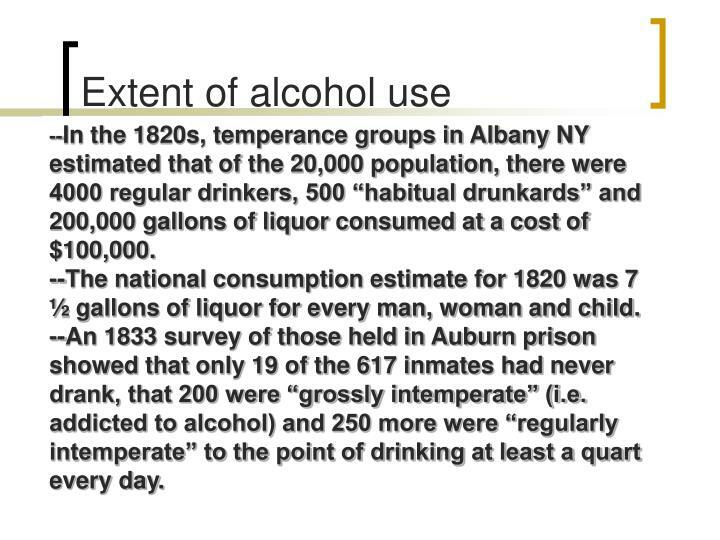 --In the 1820s, temperance groups in Albany NY estimated that of the 20,000 population, there were 4000 regular drinkers, 500 “habitual drunkards” and 200,000 gallons of liquor consumed at a cost of $100,000. --The national consumption estimate for 1820 was 7 ½ gallons of liquor for every man, woman and child. --An 1833 survey of those held in Auburn prison showed that only 19 of the 617 inmates had never drank, that 200 were “grossly intemperate” (i.e. addicted to alcohol) and 250 more were “regularly intemperate” to the point of drinking at least a quart every day. 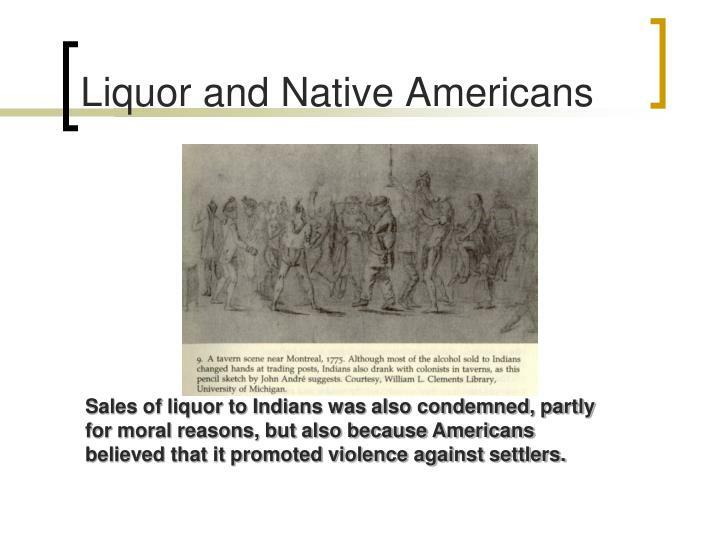 Sales of liquor to Indians was also condemned, partly for moral reasons, but also because Americans believed that it promoted violence against settlers. 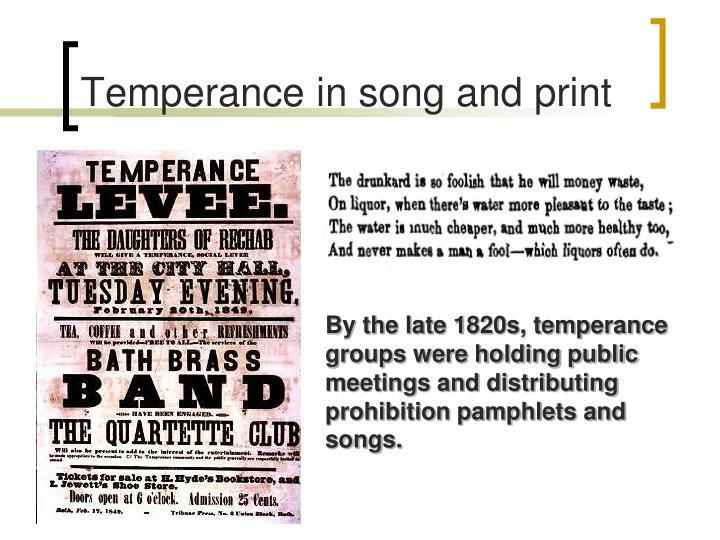 By the late 1820s, temperance groups were holding public meetings and distributing prohibition pamphlets and songs. 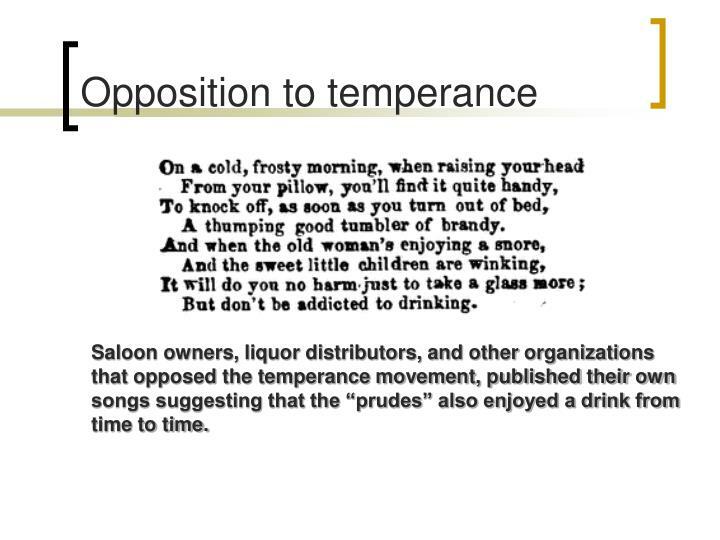 Saloon owners, liquor distributors, and other organizations that opposed the temperance movement, published their own songs suggesting that the “prudes” also enjoyed a drink from time to time. 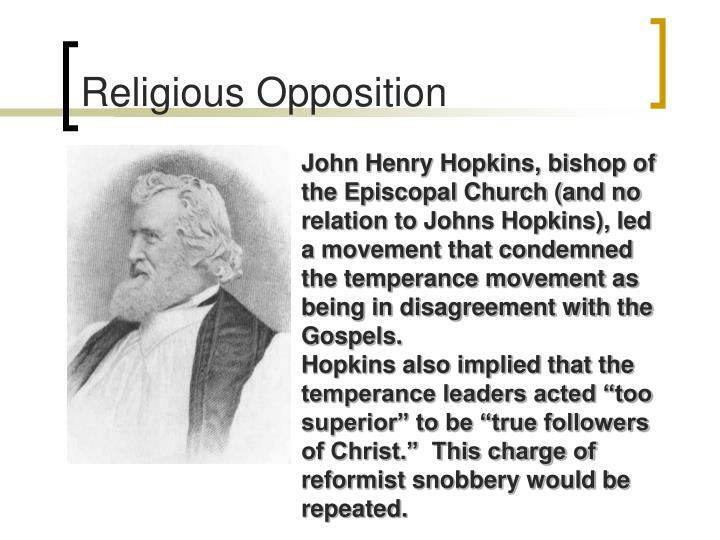 John Henry Hopkins, bishop of the Episcopal Church (and no relation to Johns Hopkins), led a movement that condemned the temperance movement as being in disagreement with the Gospels. 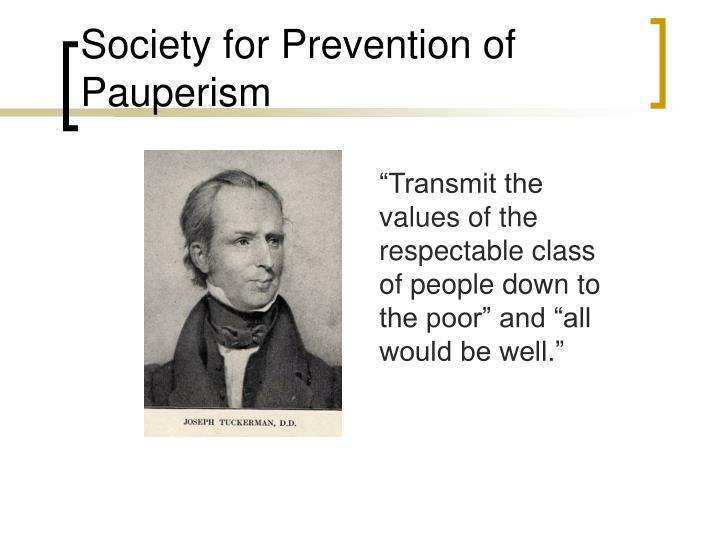 Hopkins also implied that the temperance leaders acted “too superior” to be “true followers of Christ.” This charge of reformist snobbery would be repeated. 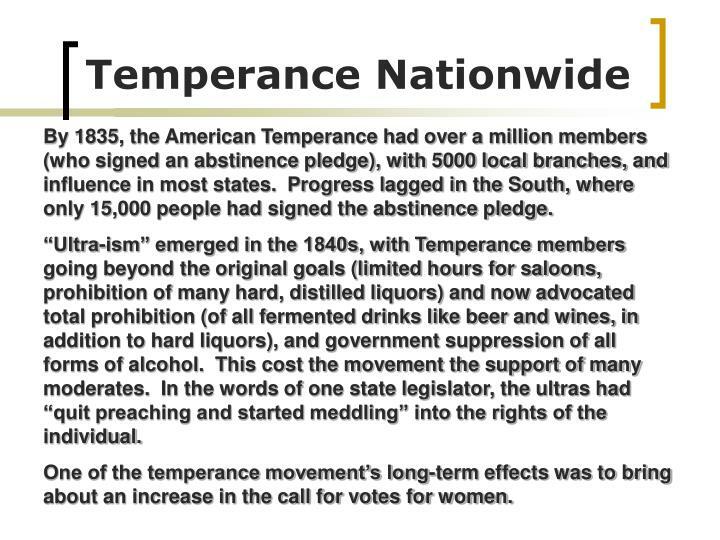 By 1835, the American Temperance had over a million members (who signed an abstinence pledge), with 5000 local branches, and influence in most states. Progress lagged in the South, where only 15,000 people had signed the abstinence pledge. “Ultra-ism” emerged in the 1840s, with Temperance members going beyond the original goals (limited hours for saloons, prohibition of many hard, distilled liquors) and now advocated total prohibition (of all fermented drinks like beer and wines, in addition to hard liquors), and government suppression of all forms of alcohol. 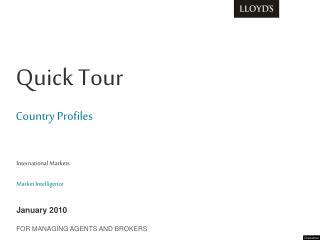 This cost the movement the support of many moderates. In the words of one state legislator, the ultras had “quit preaching and started meddling” into the rights of the individual. One of the temperance movement’s long-term effects was to bring about an increase in the call for votes for women. 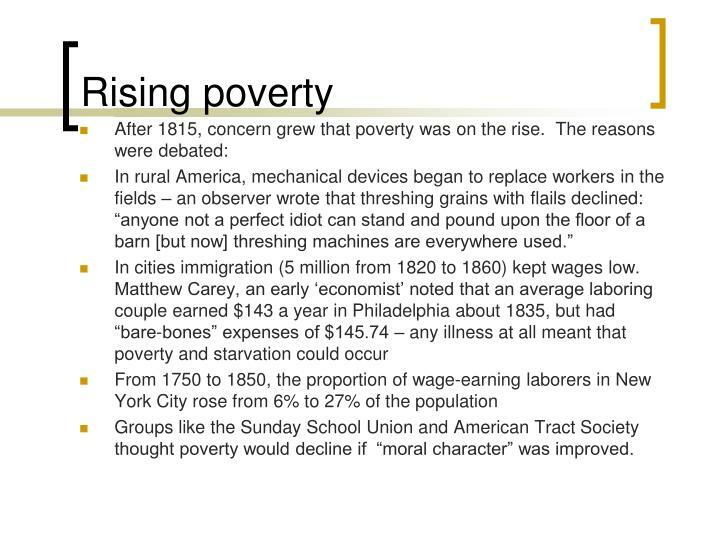 Groups like the Sunday School Union and American Tract Society thought poverty would decline if “moral character” was improved. 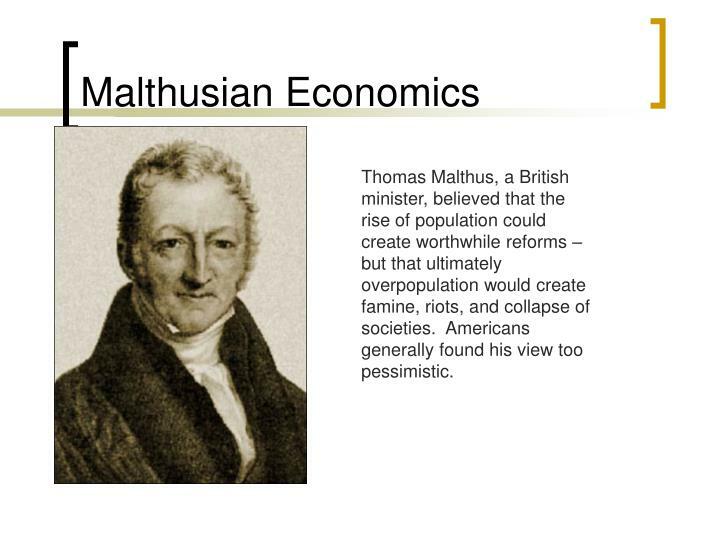 Thomas Malthus, a British minister, believed that the rise of population could create worthwhile reforms – but that ultimately overpopulation would create famine, riots, and collapse of societies. 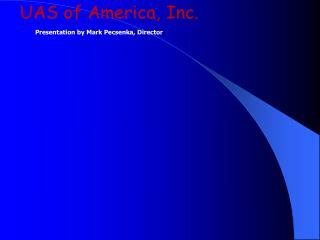 Americans generally found his view too pessimistic. 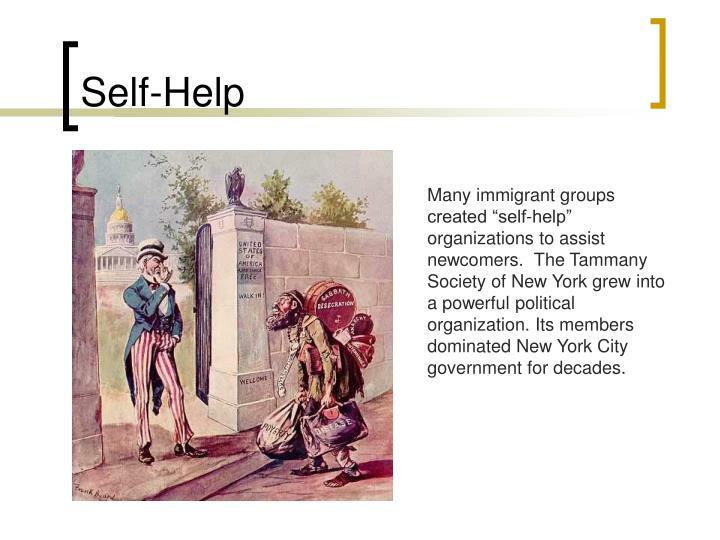 Many immigrant groups created “self-help” organizations to assist newcomers. The Tammany Society of New York grew into a powerful political organization. Its members dominated New York City government for decades. 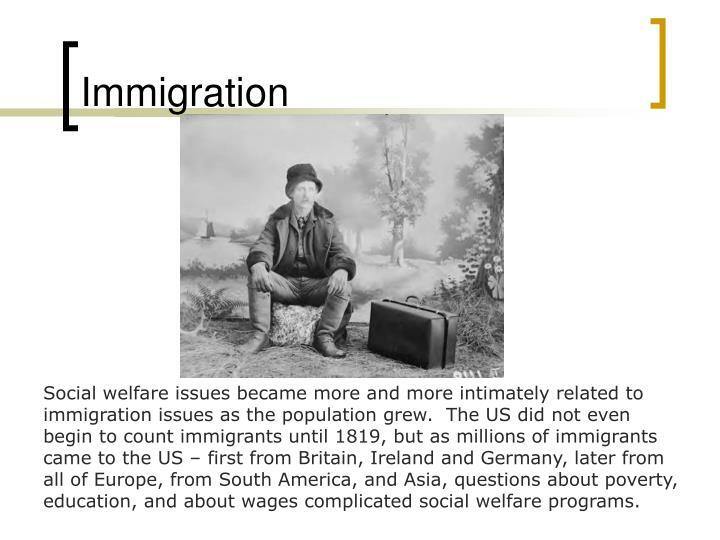 Social welfare issues became more and more intimately related to immigration issues as the population grew. 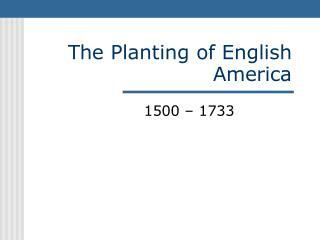 The US did not even begin to count immigrants until 1819, but as millions of immigrants came to the US – first from Britain, Ireland and Germany, later from all of Europe, from South America, and Asia, questions about poverty, education, and about wages complicated social welfare programs. 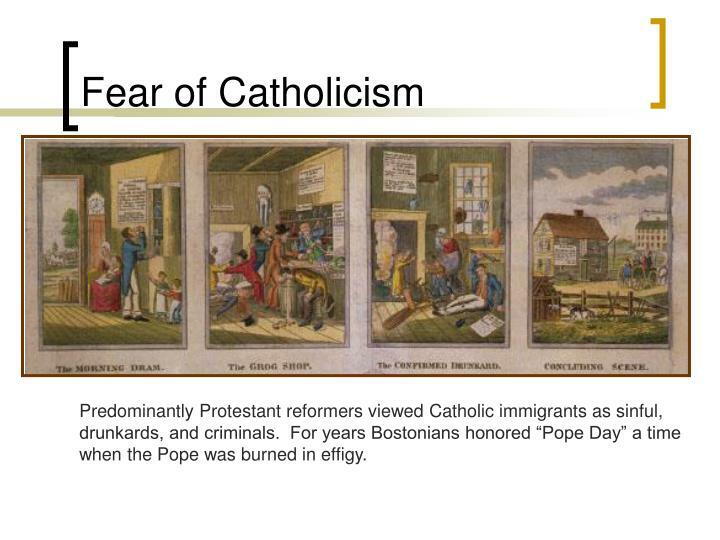 Predominantly Protestant reformers viewed Catholic immigrants as sinful, drunkards, and criminals. For years Bostonians honored “Pope Day” a time when the Pope was burned in effigy. 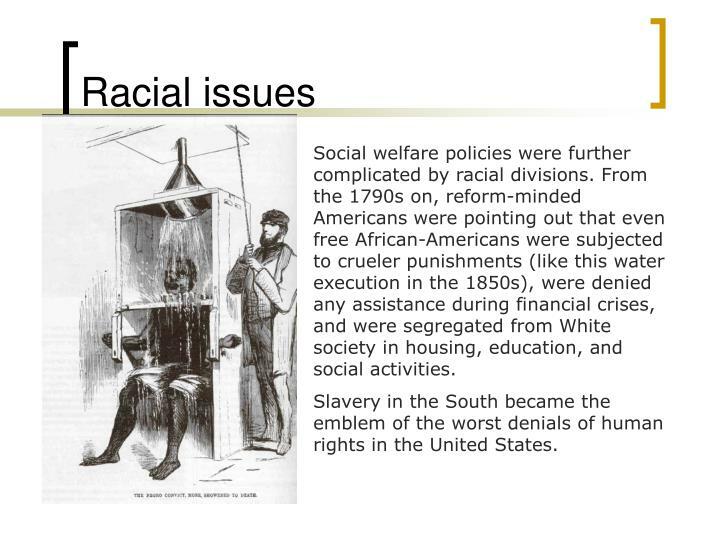 Social welfare policies were further complicated by racial divisions. From the 1790s on, reform-minded Americans were pointing out that even free African-Americans were subjected to crueler punishments (like this water execution in the 1850s), were denied any assistance during financial crises, and were segregated from White society in housing, education, and social activities. 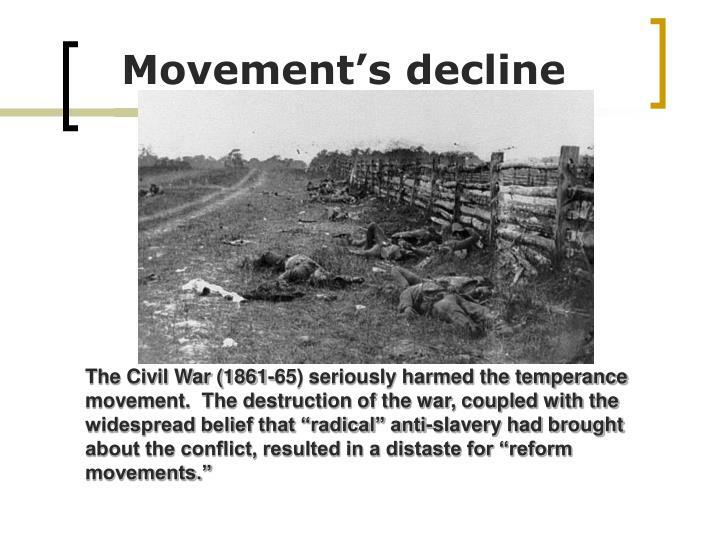 Slavery in the South became the emblem of the worst denials of human rights in the United States. 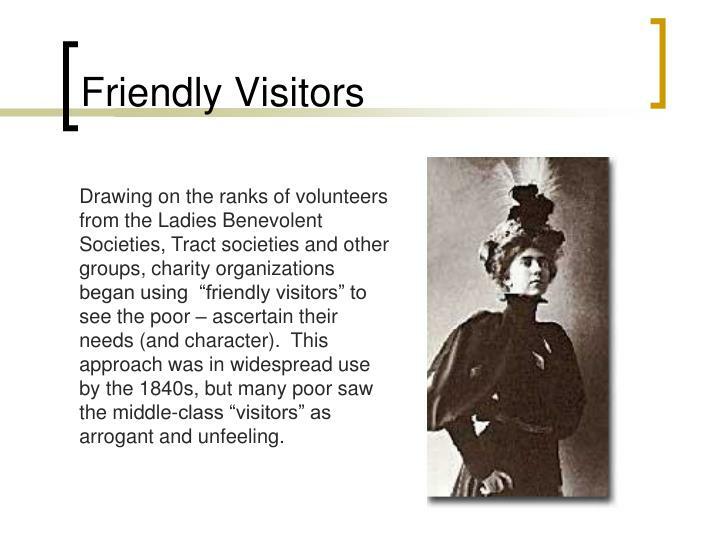 Drawing on the ranks of volunteers from the Ladies Benevolent Societies, Tract societies and other groups, charity organizations began using “friendly visitors” to see the poor – ascertain their needs (and character). This approach was in widespread use by the 1840s, but many poor saw the middle-class “visitors” as arrogant and unfeeling. 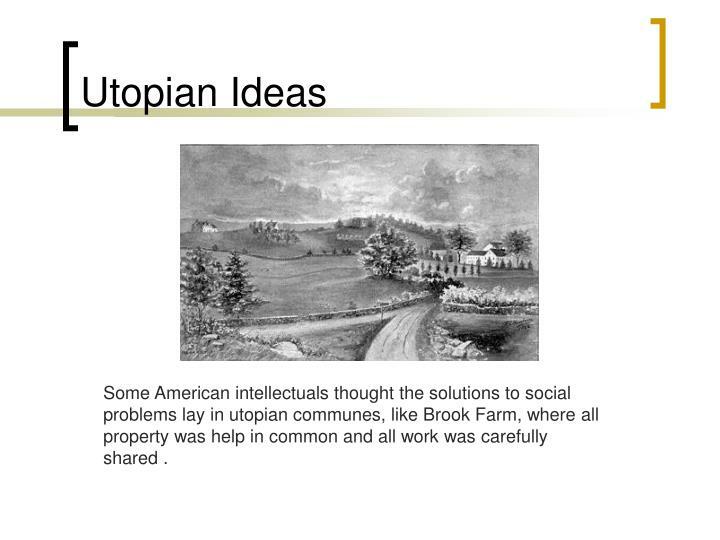 Some American intellectuals thought the solutions to social problems lay in utopian communes, like Brook Farm, where all property was help in common and all work was carefully shared . 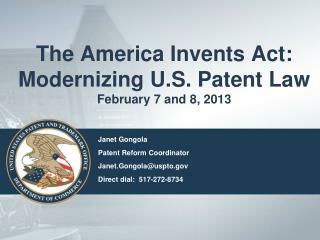 Pennsylvania prepared a different plan for rehabilitation. 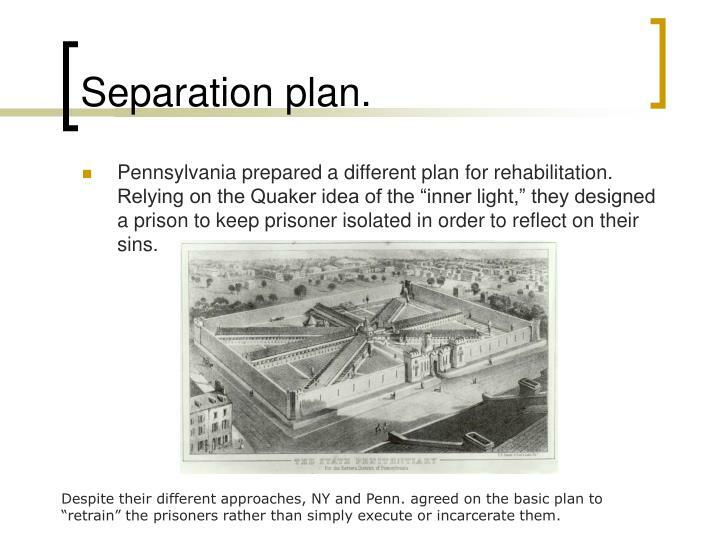 Relying on the Quaker idea of the “inner light,” they designed a prison to keep prisoner isolated in order to reflect on their sins. 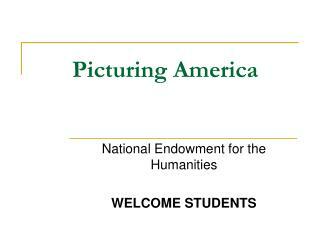 Despite their different approaches, NY and Penn. agreed on the basic plan to “retrain” the prisoners rather than simply execute or incarcerate them. 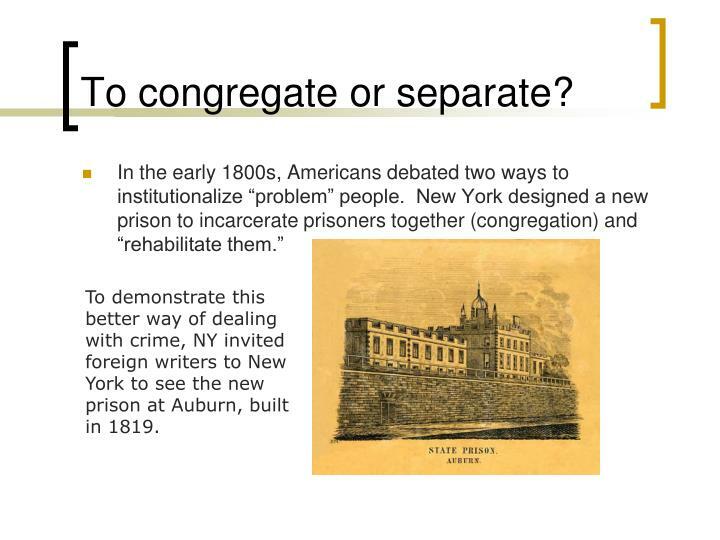 Many other special institutions followed the designs of the new prisons. 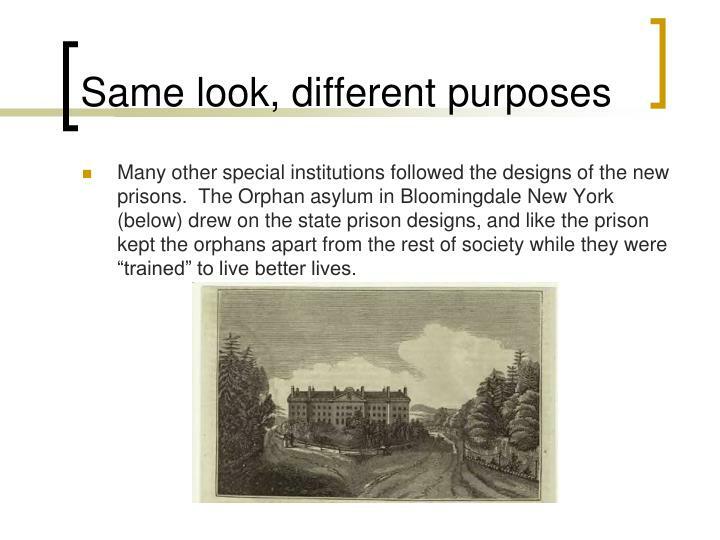 The Orphan asylum in Bloomingdale New York (below) drew on the state prison designs, and like the prison kept the orphans apart from the rest of society while they were “trained” to live better lives. 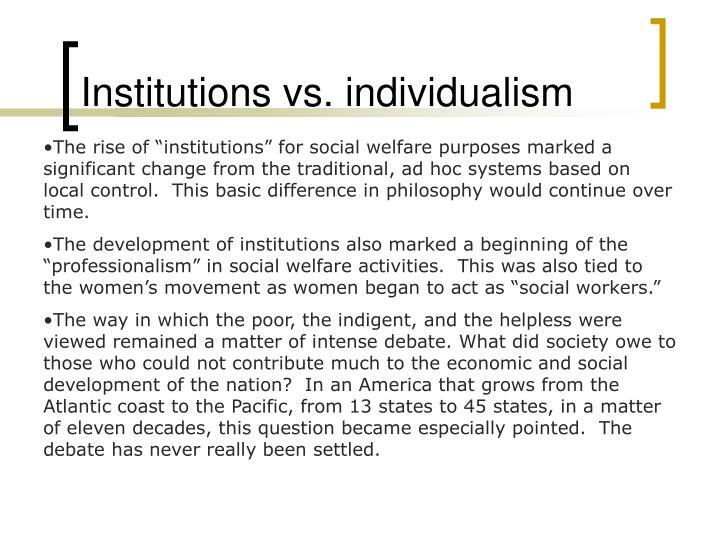 There was a marked connection between changes in social welfare practices and the nascent women’s movement. 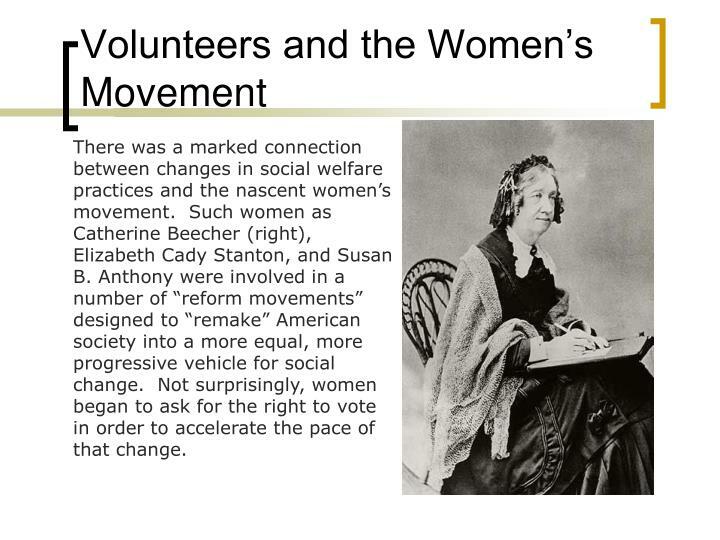 Such women as Catherine Beecher (right), Elizabeth Cady Stanton, and Susan B. Anthony were involved in a number of “reform movements” designed to “remake” American society into a more equal, more progressive vehicle for social change. Not surprisingly, women began to ask for the right to vote in order to accelerate the pace of that change. 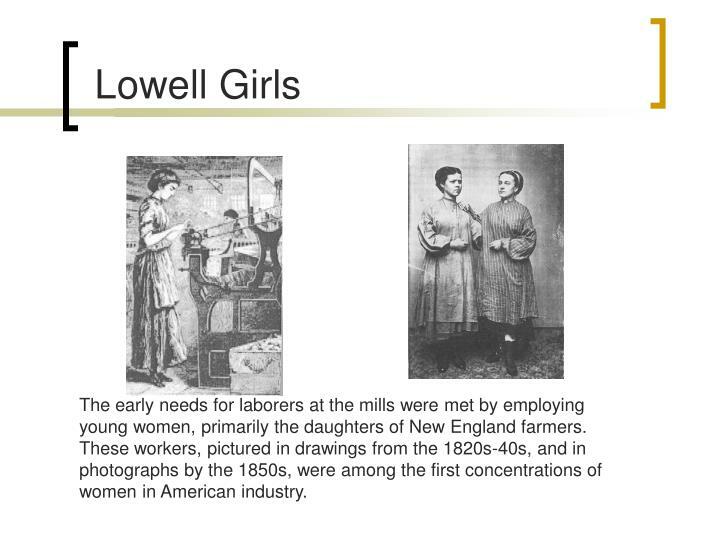 The early needs for laborers at the mills were met by employing young women, primarily the daughters of New England farmers. These workers, pictured in drawings from the 1820s-40s, and in photographs by the 1850s, were among the first concentrations of women in American industry. 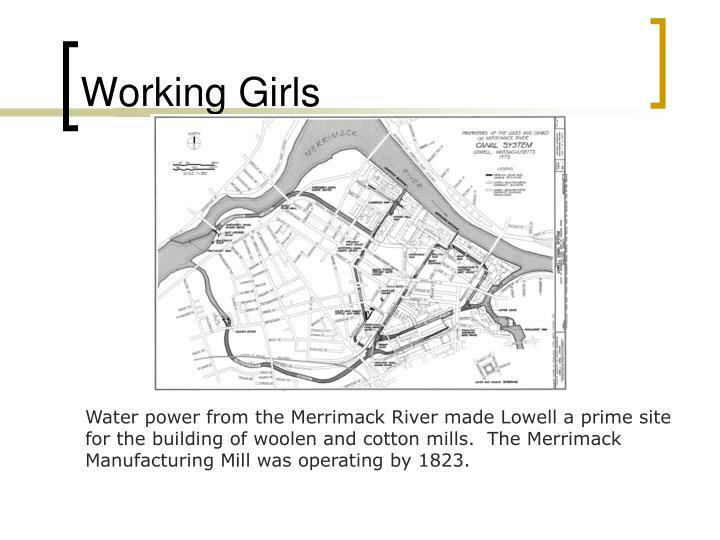 Water power from the Merrimack River made Lowell a prime site for the building of woolen and cotton mills. The Merrimack Manufacturing Mill was operating by 1823. 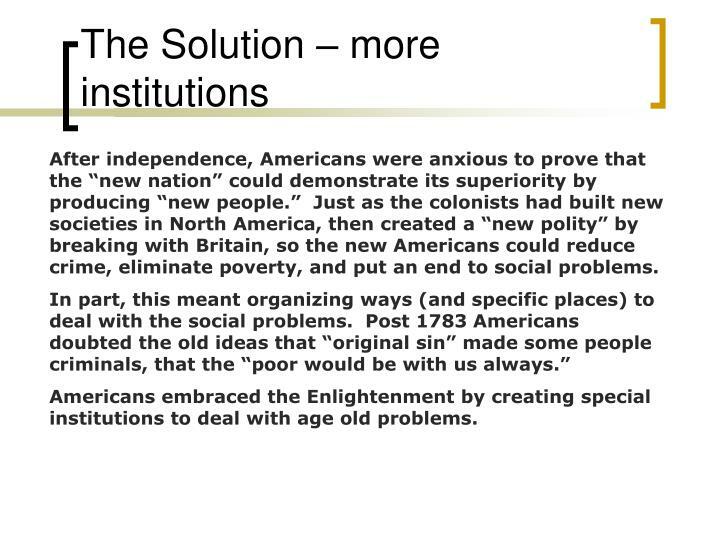 After independence, Americans were anxious to prove that the “new nation” could demonstrate its superiority by producing “new people.” Just as the colonists had built new societies in North America, then created a “new polity” by breaking with Britain, so the new Americans could reduce crime, eliminate poverty, and put an end to social problems. Americans embraced the Enlightenment by creating special institutions to deal with age old problems. To demonstrate this better way of dealing with crime, NY invited foreign writers to New York to see the new prison at Auburn, built in 1819. 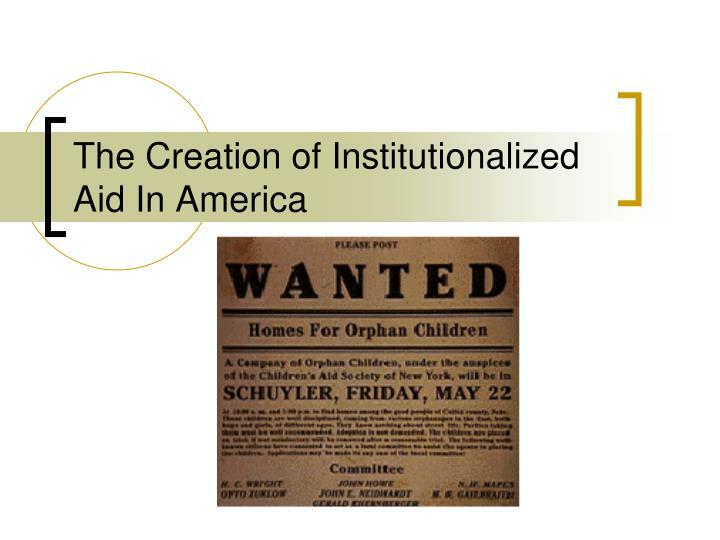 The rise of “institutions” for social welfare purposes marked a significant change from the traditional, ad hoc systems based on local control. 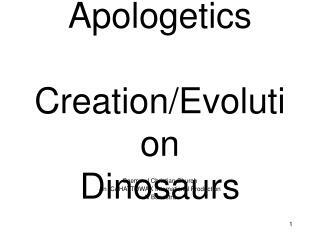 This basic difference in philosophy would continue over time. The way in which the poor, the indigent, and the helpless were viewed remained a matter of intense debate. 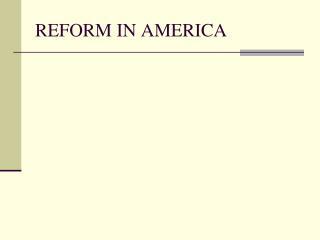 What did society owe to those who could not contribute much to the economic and social development of the nation? 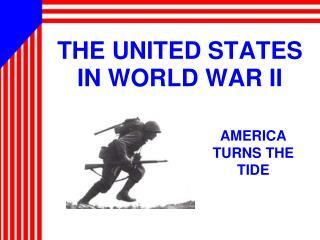 In an America that grows from the Atlantic coast to the Pacific, from 13 states to 45 states, in a matter of eleven decades, this question became especially pointed. 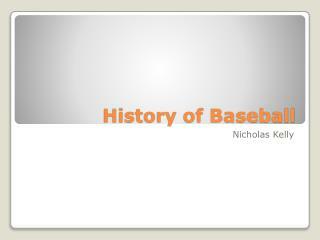 The debate has never really been settled. 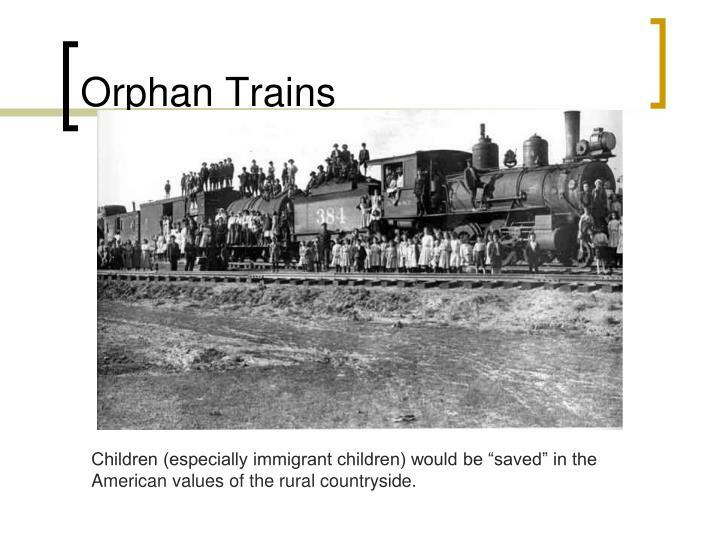 Children (especially immigrant children) would be “saved” in the American values of the rural countryside. Please take out -. 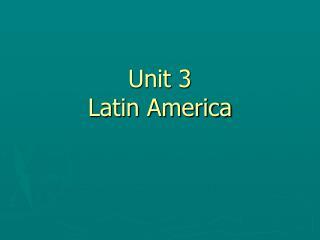 latin america paper from yesterday pencil/pen colored pencils/crayons, twistables 3-ring binder paper. student planner. 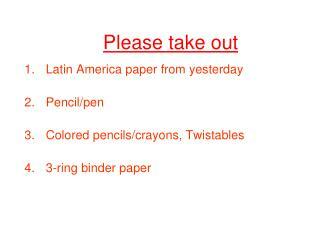 please take out a pen or pencil. 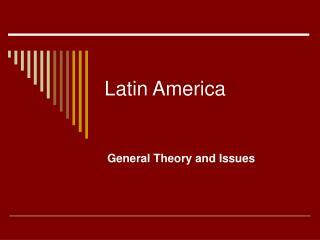 latin america mexico central america south america. mexico.